Cruise Critic: Have you ever been on a cruise before, or is this your first experience cruising? Sheila E: No, I've been on cruises before. This is, I don't know, maybe my six or seventh time, at least? I love it. I do love cruising a lot. But this was my first time doing The 80s Cruise. CC: What are some of the other cruises you've done? What are some of the lines or places you've gone? SE: Mostly Royal Caribbean. I did the Dave Koz (a jazz musician), a couple of his cruises. The Soul Train [cruise]. 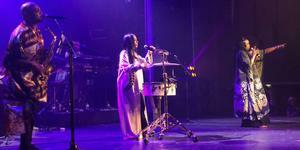 And I did my own cruise, the Sheila E. Glamorous Life Cruise. I rented the whole ship. We left from Miami. And that was about two years ago…I'd like to do it again. CC: That's cool. What do you like about doing the cruise ship performances that's different than, say, doing a regular concert on land? SE: It's not really just a concert that's different. We give you 150 percent, with lights and everything. It's just, I love being on the water. I don't take it for granted that the fans have saved their money. Some do it where they pay a certain amount [each month] and they look forward to the cruise. So, you want them to have a great experience. For them to spend their hard-earned money to be here for a week, it's important for them to have a great time. So, when they show up at the venue, you know they're there because they want to be. And that's really rewarding for us. CC: How do you feel about running into them and things like that at the buffet? Are you able to interact with them outside the concerts? SE: The first couple of days, I was able to wear sweats and stuff; no one had no idea who I was. Only a couple of people knew that it was me. And then once we played, forget about it. It was like, okay, back to "Aeeeeyyy." But they've been very gracious. When we're at the buffet, they wait until after I eat. So, then we take pictures [or] I sign. A lot of people brought their albums -- like four, five, six [of] my albums to sign. It's been cool. Like I said, we want to make sure they have a great experience. CC: On these cruises, are you able to carve out time for yourself, too? SE: A little bit. I try to at least go out and see the town or the city or wherever we may be. If it's my first time being there, hopefully I can do that. And I always try to ask if it's possible that I can perform while we're out to sea so we can go into the port. If we're playing that day and if it's an early show, we're playing first, there's not enough time. We have to do sound checking, and make sure everything is good for everyone. So, we don't get to leave the ship most of the time then. CC: Since you've been on so many cruises, are there any cruise ports that stand out to you? SE: The Mediterranean cruise was amazing. Oh my God. CC: Because you go so many places in one cruise, right? SE: Yeah. There was another, in Greece. We went to Mykonos and just ... I mean the whole Mediterranean. And the food was amazing. But the Mediterranean was the best, though. The color of the water, the calmness, and just the whole experience was amazing. To be able to just to see the culture itself was amazing. It's really beautiful. CC: Do you think there's a certain vibe that people get on cruises because they're around the water? SE: I think people love being around water. It is calming, relaxing. It's like you're ... It's not the same, but it's almost like saying you're going to Vegas. What happens in Vegas stays in Vegas. On the cruise, I feel like it's the same thing. Like everything that's happening here, this is our experience, you know? And I mean, for me, like I said, it's calming. Last night I woke up in the middle of the night. I opened my sliding glass door into the deck, and I sat out. It was 3:30 in the morning and I just looked at the stars, and have my moment of just meditation and prayer. And said, "all this is my time for just me and God right now." And then after, I was just like, just "thank you, thank you, thank you." It took me a minute, but in those moments for me, there's no distraction. I think everyone tries to get that moment of having a good time away from work. [The cruise] becomes our own community and our own family. You meet new friends and then it becomes your new family. And I think people enjoy that. The next 80s Cruise takes place March 8 to 15, 2020, as an all-inclusive sailing on Explorer of the Seas. Bands announced so far include the B-52s; Berlin; Patty Smyth of Scandal; Tony Hadley of Spandau Ballet; Tony Lewis of The Outfield; Asia; Big Country; the Motels; Lita Ford; Bow Wow Wow; and more. Go to The80scruise.com for more information.